so then i did the glitch moving forward and asked "what about awkward crawling?" then i said "no i dont, please enlighten me"
The ban reason isn't the most precise, nor was that needed a permanent ban, but I'd kick you if I were him. Seems like he had a lot of stealth trolls recently to perma you like that. A Fine Building Block is a nice guy as far as I know; care to provide context? So you got kicked by an afk kicker? This doesn't really belong in this thread. Go die in a furnace"
I met that kid. He's 7 years old. He came to my server a week ago and was acting really annoying to everyone so I kicked him. Yes I am but that was my server, I can do what I wish. you do realize that just because you can doesnt mean you should? Nice dismissive post Fine Building Block. Can someone report this please, my report button is missing. Quote from: Badspot in "If you don't care, don't post." 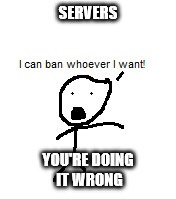 "The host can do whatever they want, it's their server"
Might does not make right. Just because we can't physically stop people from being jerks on their own computers doesn't make it ok. We are attempting to stop them via social pressure, that is the point of this forum. This is the ban I receive after asking this guy for admin so I can disable Renderman kicking players. I can see why most Blocklanders don't like people with a high BL_ID.